I love using this mixer. It is a bit heavy to move around but that is the only draw back I have with this mixer. I use to decorate cakes and baked a lot. I don't as much now but sure wish I had this back then. I have not gotten any attachments for it yet but that is on my list! This is a great mixer. I love everything about this mixer! The quality is top notch! I don't care for how heavy it is, but that just means it is heavy duty and good quality in my book. I love how evenly it mixes when I am baking cookies or cakes. 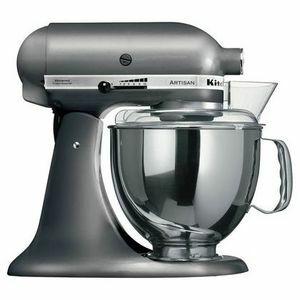 I love it, its quiet, durable, great mixer. But its heavy and takes a lot of space. I put off getting one for years because the size and storage issues, however now that I have one I wish I had done it sooner. I love to bake and everything is so much easier and faster now! I would buy this for anyone I need a shower gift for! I use it multiple times a week. Making cakes or cookies or other treats with my kids. I have been baking with my girls for a few years now and they also know how to safely use it! Best gift I got for my wedding shower. 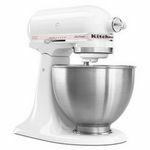 I love my kitchenaid mixer! Mixes up batters great! Can't wait to purchase attachments for it. This item with the attachments can eliminate many other kitchen gadgets so you can have only 1 on your counter. I had stopped baking prior due to fatigue. I got my Kitchenaid mixer and now I love baking again. It helps speed up the baking process and my arms are not tired after baking. 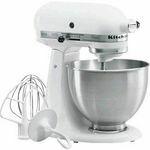 I can use the mixer to whip sugar and cream, while I get the other ingredients ready. I made a tres leche cake last week and it turned out amazing! 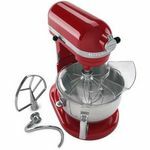 Love my new mixer and the color is gorgous! I bought my mixer a week ago, I picked the color bird of paradise which is a salmon color. It's not only beauty but it works so well. 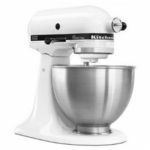 I have had two other stand mixers that were cheaper but I found either they were not strong enough to handle my baking or the attachments broke because they were plastic. I know this is heavy but it's made to last. This is my go to appliance.